Trianon Tequila Blanco is 100% Agave produced at Tequilera Las Juntas in Amatitan, Jalisco, Mexico. 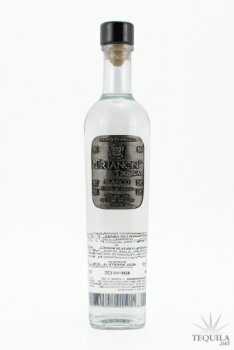 Crystal clear and bottled directly after the second distillation, Trianon Tequila Blanco is the true expression of the Blue Agave. Third generation master distillers, Alejandro and Saul Ocampo, use traditions and techniques created long ago. Every batch of Trianon Tequila is small and not mass produced, and created only when the time is right. The distillery is located in Amatitan, which sits at the foot of El Colcan de Tequila (the Volcano of Tequila), where the rich, volcanic soil makes the Blue Weber Agave grow larger and more luscious than anywhere else. Trianon tequila is an entirely new brand to me. They've been around for a little while and the company makes their tequila at NOM 1500 (Tequilera Las Juntas, S.A. de C.V.), but is based in Tennessee. Normally I only picture the expression that I'm tasting at the time, but sometimes interesting packaging is worth noting and Trianon sells the entire line in a very attractive and cool stackable 375ml trio. Let's hope the tequila is as good as the package. Aroma: Cooked agave with some earth and some very faint vegetal notes and a hint of mint. Very natural smelling and not overly sweet. Initial Taste: A lightly sweet entry with nice agave flavors and the light mint. Body: Thin bodied on the palate. The vegetal notes are stronger than the earthy ones detected in the nose. The agave is still present and a peppery note sneaks in. Lots of flavors despite the light mouth feel. Finish: A decent linger of the vegetal agave with mint and light peppery agave punch. A pleasant finish that last for a good while. This is a very solid bottle for the price. I like the consistency of the vegetal/mint notes and the sneaky agave peppery punch mid-palate and at the finish. I'd definitely recommend picking this up...especially with the cool packaging and the fact that you can try all 3 expressions at an affordable price. Well thought out idea by the people at Trianon. I really wanted to like this brand since it is based in Chattanooga, TN - within my home state. But it falls short in almost every aspect, especially considering that (according to press releases) they are trying to penetrate the 'super-premium' market. In the nose, some cooked agave, but not a major presence; there is also a little mint, and a little sourness. Taste was mostly sweet, but there is a bitterness and a bit of a sour bite. The body was fairly thin and light, but not watery. Finish was unremarkable except for quick, unpleasant heat - maybe some pepper, and a slight lingering of raw agave. This was not a very enjoyable experience in any aspect. I really just wanted it to be over. It sells at a premium, which I don't understand. I purchased the stacked flight set of the of 375ml bottles, which is clever. I have also seen the individual 750ml bottles in the stores; they are attractive, but not anything special or unique. Note that in the stacked set, the top one is the blanco, and has a wooden stopper and synthetic cork.